The weather patterns nearing Easter 2002 were very interesting. Earlier in the week a cool pool of air in the upper atmosphere had moved over inland NSW. This had given widespread thunderstorm activity, some were severe. By mid week a surface low had formed as well. It was uncertain just how far the low would develop, or even its movement. Wednesday saw widespread thunderstorms over eastern NSW. These storms were streaming from the north along the eastern side of the low ( see 750mb picture below report ). 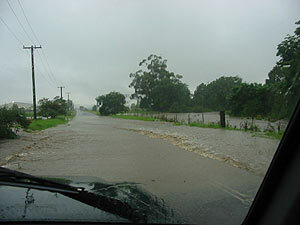 I made the prediction that flash flooding may occur in the Illawarra over the next couple of days. Even though I was correct the flooding occurred from slightly different conditions to what I expected. I had expected a more maritime influence with stronger winds and heavy showers. Good Friday saw brief sunshine in the Illawarra before low cloud. I wasn't really expecting thunder action. Around 12.30pm several distant rumbles took my interest. The storm was located near Mount Kembla on the Illawarra escarpment. It was not moving fast and therefore high rainfall was possible. I drove westwards towards the escarpment. Some lightning was occurring from the edge of the system, but not overly active. Right up until 2kms from the mountains there was little evidence of any heavy rainfall. 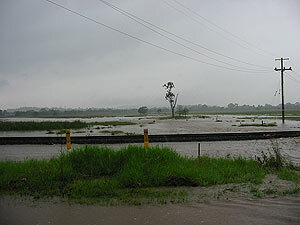 I was about to chalk it up as another bust, but as I neared the Kembla Grange racecourse signs of heavier rainfall became apparent. Despite this I was still quite unprepared for my next sight, the highway cut by floodwater and police holding up traffic as the water was too deep to cross. Having a 4WD I took the plunge and continued westward to the escarpment foothills. 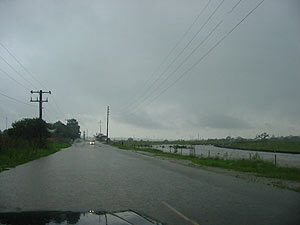 Here the flash flooding was very evident with whole sections of roads under, factory yards under water and water through some house yards.